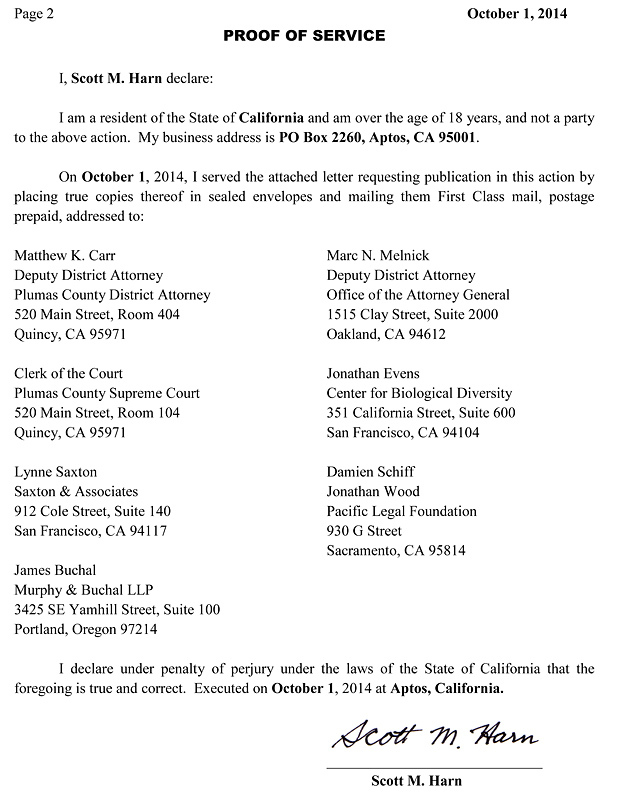 Will Judge Ochoa follow the unpublished People v. Rinehart suction gold dredge ruling? The answer to that question is, "Yes, with your help!" As we mentioned in our 09/24/2014 update on the suction gold dredging fight in California, Brandon Rinehart was successful in the appeal of his conviction for suction dredging without a permit. The Third Court of Appeals for California ruled the trial court must allow Rinehart to argue that federal laws preempt state laws regarding mining. Rinehart was represented by attorney James Buchal. 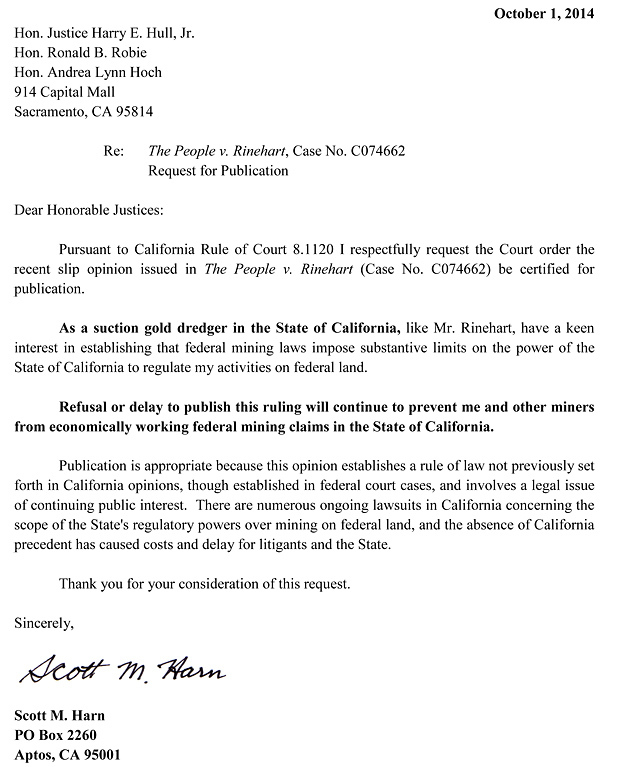 What this means in simple terms is that Rinehart's case will return the the lower court for trial where his attorney will argue that California prohibited Rinehart from utilizing the only economical method of mining his federal mining claim when the state prohibited suction gold dredging, and that federal mining law pertaining to the regulation of federal mining claims preempts state law. There is plenty of case precedent in this regard, including California Coastal Commission v. Granite Rock and South Dakota Mining Association v. Lawrence County. The State of California may choose to drop the case in order to avoid losing the preemption argument. This means the unpublished opinion by the Third Appellate Court could remain unpublished. While federal courts have allowed lawyers to cite unpublished court opinions issued on or after January 1, 2007 under Federal Rule of Appellate Procedure 32.1, California law still forbids lawyers from citing unpublished opinions in state courts. To remedy this problem, we need to get the Third Appellate Court to publish the Rinehart opinion. 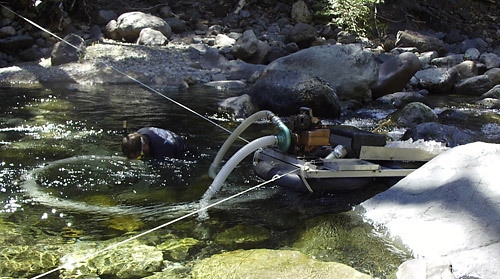 This opinion can have a huge impact on the consolidated suction dredging settlement hearings currently underway in San Bernardino in front Judge Gilbert Ochoa, and you can help get the Rinehart opinion published. To encourage the Third Appellate Court to publish the opinion, each of us needs to send in a formal request for publication. The rules state that requests must be sent to the each of the parties listed along with the court. It's a total of eight letters. Send both pages to each party. You can download the letters I sent -- the bold type is what you will need to change. Hon. Justice Harry E. Hull, Jr.
Additional Note: Both pages must be signed. You can look at the court record online and see when your letters are received. Unfortunately many of them are not valid because one of the pages does not have a signature.